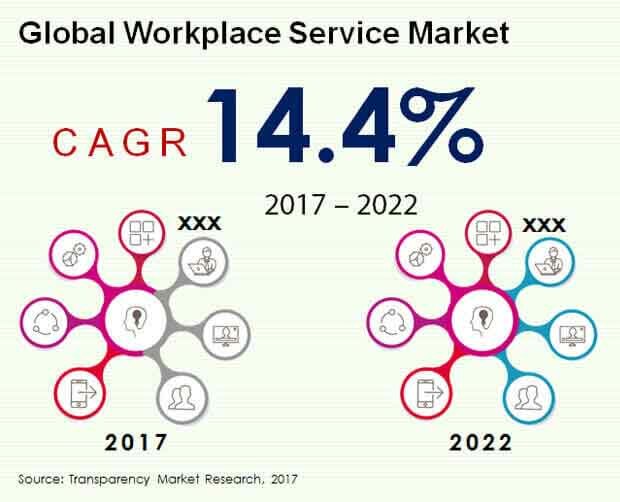 The global workplace service market is expected to rise at a high growth rate owing to the increasing demand for technological solutions in rising corporate environment, according to the Transparency Market Research (TMR). The companies present in the workplace services market are making efforts to provide better services for their users. Some of the prominent players in the market are Wipro Limited, Accenture PLC, HCL Technologies Ltd., TCS Ltd., Cognizant Technology Solutions Corporation, IBM Corp., Capgemini SE, Fujitsu Limited, NTT Data Corp., and CDI Corp. Companies are making efforts in research and development to enhance the workplace service. According the TMR analysis, the global workplace service market is estimated to grow from US$ 76.4 bn in 2017 to US$ 150 bn by the end of 2022. The market is expected to rise at 14.4% of CAGR during the forecast period 2017 to 2022. Under the service type, enterprise mobility management solution segment is likely to dominate the market, as compared to the other segments in this category. This segment is projected to draw a valuation of US$ 17.7 bn and is expected to rise at 23.2 % of CAGR during the forecast period. As per geography, North America is leading the market attributing to wider adoption of workplace service software and rising demand for technologically advanced services. The workplace service is required to provide better facility to the employees that will help them to grow their working efficiency. It also help in saving time of the employee’s in which they can develop their core competencies. The growing use of various software used for processing and data collection has potentially raised the need for workplace service in the corporate sector. In addition, higher use enterprise mobility management services also play a significant role in the corporate sector. . Growing need for tech support is expected to complement the rise of the market. Thus, it will cause a surge in demand for workplace service globally. The use of digital technologies is growing largely in life sciences and healthcare sector. Therefore, workplace service is playing an important role in increasing the efficiency of software used in these sectors. Moreover, rising use of digital prescriptions and electronic health records that have resulted in collection of vast amount of medical data, thus urged the need for workplace service. The use of technological solutions increases the working efficiency and provide satisfaction to the employees. Conversely, the market do have certain challenges that might impede the growth of the workplace service market. Constant threats regarding security for the data protection services act as a major challenge for this market. Growing availability of software acting as a substitute for the market may hindrance its growth. Looking into these types of challenges, companies are required to be highly alert and aware about the technological changes taking place in the surroundings. Therefore, by meeting up these challenges, the global workplace service market is expected to grow largely throughout the forecast period.